Continuing where I left off of Sandara Park (박산다라)'s post.. this is 2NE1's youngest member clad in head to toe designer outfit. Just like Sandara Park (박산다라), Gong Minzy (공민지) was dressed in the same designers. Her Burberry Prorsum Metallic Quilted Leather Biker Jacket was styled with Christopher Kane Bird Print Tank. 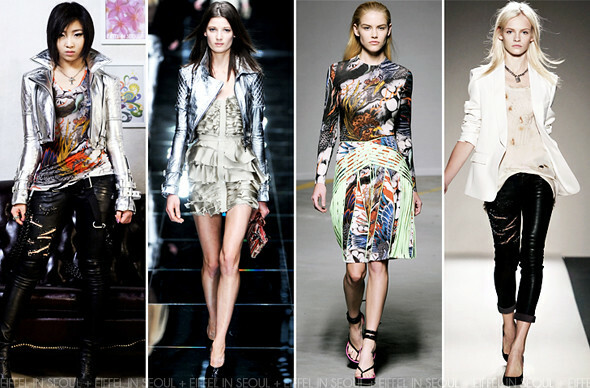 Completing with a pair of leather pants from Balmain Spring/Summer 2011 and a pair of leather boots. Shop Burberry Prorsum on Burberry.com, Net-A-Porter. Shop Balmain on Luisa via Roma, Net-A-Porter. Shop Christopher Kane on Net-A-Porter. Unfortunately, this was one of my least favorite outfits. I didn't like the metallic jacket with the bird print tank but if they wanted her to look fierce, they definitely got it right.